Kids’ play centers are designed to help your child hone their creative skills, burn off some energy, and make new friends. In Oklahoma, there is plenty of opportunity to do so. From trampoline parks to massive play places, here are the best kids’ play centers in the state! Ackley Park has many attractions, including a carousel with 36 hand-carved wooden horses, two bench seats and a spot for a wheelchair. Play miniature golf or ride the miniature train. You’ll also find a kiddie playground, two ponds, four tennis courts, six pavilions and two volleyball courts. It’s located on historic Route 66. The park is free, but the carousel, mini golf and train rides all have a small fee. The city of Woodward calls Crystal Beach Park an “oasis of escapism.” There’s something for everyone of all ages, mini-gold, Kiwanis train, horseshoes, paddle boats and the family aquatic center that features a swimming pool, hoses, buckets and water spouts, water slides and more. The local Kiwanis Club operates this “amusement park” with a tilt-a-whirl, merry-go-round and airplanes. The park is free, but the rides take one or two tickets. They keep the prices low so it won’t break your bank. There are three distinctive areas in Johnstone Park. Area 1 includes historical information and an art center, but the big feature is the Kiddie Park which includes 15 rides perfectly sized for toddlers to grade school children. Area 2 has a skate park, playground and picnic area and exercise path. Area 3 includes a bird sanctuary. Beat the heat in this play center that is indoors. The 2,000-square-foot playground structure has three levels that include wave and spiral tube slides. There’s a trampoline and foam pit. Parents can play or enjoy free Wi-Fi while they watch. There’s even a separate toddler/infant area for the smallest ones to be safe and enjoy fun activities. At Andy’s, you’ll find bumper cars, laser tag, a rock climbing wall and much, much more. Most of the attractions are indoors, so the weather won’t stop you. There’s also a water play park that’s open to guests of all ages from children two & under with a swim diaper to seniors 60+. Purchase tickets online for a discount. At this play place, adults are free with a paid child’s admission. Kids that can’t walk are free. It features bounce houses, slides, a zip line and of course, a multi-level foam ball arena. Make sure to check the calendar for open play times before you go. This huge inflatable playground has open bounce times for children and adults. Young toddlers are welcome and have their own area to play. This center offers a two-level laser tag facility, a “Ballocity Action Arena” with two inflatables, skating and mini-bowling for the whole family. There’s even a “Tiny Town” designed for the youngest guests. Make sure to check out the daily specials—Wednesday is half-price laser tag. The Edmond facility has six trampoline courts for jumping, games and more. You’ll also find a smaller kid’s jumping court for 24 months to six years-old. Check the calendar for open jump times before making plans. There’s another location in Moore. 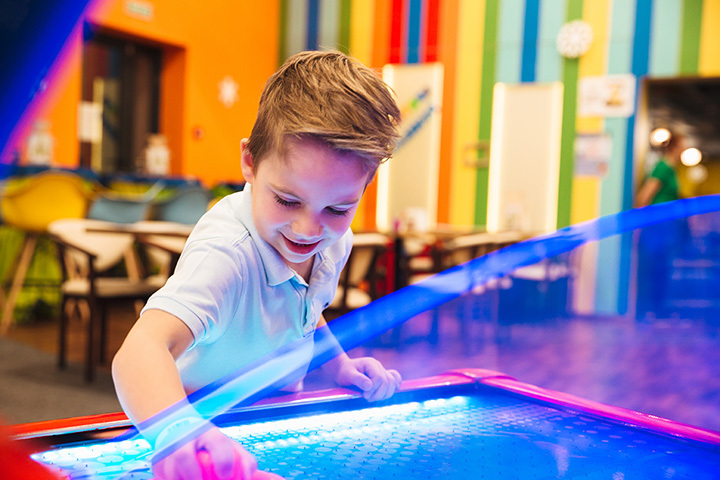 A cross between a museum and a kid’s play place, this center lets kids play in specialized exhibits to teach them the wonder of life. There’s a forest playground, a farm station, a water works exhibit and much, much more. Your child can pretend to be a doctor, an artist or builder, all in the same day.